1,00,000 Hits & 100 Posts Later… A Dream, An Appeal. This is all I have to say for all wonderful things Sriman Narayana has done for me, starting with planting the desire to write this Blog, to this dream that has come to me now. Please do read and let me know your thoughts. Its time to do something, do something worthy for all He has done. What started out as a little hobby has given birth to a strong dream, Sri Vaishnava Digital Fund. Sri Vaishnava Digital Fund – We know that seems a little odd, but actually it makes perfect sense. Every age, there is a medium through which ideas & thoughts are written, distributed & stored. In Sri Vaishnavam, Alwars used songs, Acharyas used manuscripts, Kings built temples and so on. All these captivated people, who then came to learn and know about the rich treasure that is Sri Vaishnavam. Back then, those were the only available mediums. Today, to a large extent we have been using just Books and to a small extent CD’s for Upanyasams, while todays technology offers a lot more – Animation, Graphic Novels, e-Learning, Internet, e-books, Rich Audio & Video and so on. But this technology itself has been the biggest hurdle too. Earlier if someone had to write a commentary on say, Thiruvaimozhi, all he had to know was how to write and have a neat Handwriting. But today? The person should know computers, the softwares in it to write and edit, the internet to publish it and the list goes on. This just is for e-books. What about Animation, Graphic Novels, e-Learning and so much more? This exactly is the need for setting up such a fund. We do have e-books, graphic novels on Sri Vaishnavam. But what about the aesthetic Quality? Is it good enough to impress a layman, children, people from other faiths? The core content is important, but similarly it is also important to be presented well too. And let’s just think of this. We all know Sri Vaikuntam is such a magnificent place with milky white roads, bliss everywhere; but how good it would be if we can have High Quality Artwork, Animations of how possibly it might look and have a caption, “My Next Home”, wouldn’t that impress & inspire a layman and even Sri Vaishnavas?. This is just one example, a lot more can be done. Archive the entire Divyaprabhandhams, all the Vyakhanams and all other works of our illustrious Acharyas in an easily searchable and downloadable format for everyone in the world. Produce top quality documentaries on all the Acharyas & Alwars. Produce Printed & e-Graphic Novels on Alwars and Acharyas that would interest children, youngsters and those new to Sri Vaishnavam. Create interactive, interesting, rich e-learning materials for important Sri Vaishnava literature. Top Quality arts of Alwars & Acharyas, High Resolution photos of Divyadesams and Utsavams for use in Sri Vaishnava books & websites. Produce Comprehensive and regularly updated Travel guides for all the Divyadesams and the Abhimana Stalams. Build a website that would be the pivot for all the above ventures. All the content produced would be downloadable for free for everyone. It’s been sometime since a post and even more time since a post About the Blog. I never planned even to put this one, but this nice little e-mail from WordPress made me want to share the Stats with reader of the Blog who had been very encouraging always. Once again I thank Sriman Narayana for all the blessings He has showered on me and the blog throughout. In 2010, there were 16 new posts, growing the total archive of this blog to 115 posts. There were 43 pictures uploaded, taking up a total of 11mb. That’s about 4 pictures per month. The busiest day of the year was February 3rd with 365 views. The most popular post that day was Koorathalwar Thirunakshatram. The top referring sites in 2010 were en.wordpress.com, google.co.in, facebook.com, mail.yahoo.com, and search.conduit.com. Some visitors came searching, mostly for kinchitkaram, koorathalwar, velukkudi krishnan, kinchitkaram trust, and velukkudi krishnan upanyasam. Blog Milestone : We are 2! Exactly a year back, on the 30th of January 2008, this blog on Sri Vaishnavam, came into being with a humble idea of being a useful Vaishnava resource online and later on have a full-fledged website on Sri Vaishnavam. 19,606 hits and 365 days later, I would like to thank the visitors who have visited, commented & linked to this blog regularly. 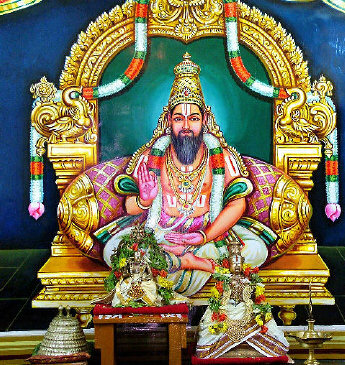 Above all, nothing would have been possible without the divine blessings of Sriman Narayana, His divine consort Sri Lakshmi and Alwars & Acharyas. I just pray that let me do only what pleases Him. Blog Milestone : 10000 Hits! Sriman Narayana and his divine consorts have been very very kind on us and we are having blog milestones very often. We have crossed 10000 hits very quickly. 100 hits per day have become quite common, 135 hits being the highest we have got. One more interesting thing is that, we are being listed very often in Google searches. Just try searching for Sri Vaishnavam in Google and we are at 3!. Search for Sri Vaishnavam blog… and we are at 1!! Apart from these many Sri Vaishnava related searches [Namalwar, Ramanujar, Alwarthirunagari] too list our blog in first page. All these are, personally, very humbling to me. All I wanted to do was gather & put in what I know about Sri Vaishnavam. But the Lord has been very kind and has taken this blog beyond my wildest imaginations. All I pray to Him is, let me always do what pleases Him. Finally I thank the readers for regularly visiting & making this blog so popular. With the Divine blessings of Sriman Narayan, Sri Lakshmi, Alwar & Acharyas we have crossed 5000 hits in a blink of an eye. On April this month, we had a post when we reached 1000 hits. In 3 months we have got another 4000 hits. We had 856 hits in April, 932 hits in May, 1420 hits in June and 1003 visits for this months as of now. Last week recorded the highest number of 395 hits [per week]. And somedays also record more than 100 hits. This was something I never expected. Sriman Narayan has been very kind on me. I would like to thank each of vistor for giving such an response to this blog. I would request your patronage always in this spiritual journey. I request you to leave your comments & suggestions for improvement of the blog. With utmost humility I would like to inform that this blog has crossed 1000 visits in under 3 months. Under the blessings of Sriman Narayana, Sri Lakshmi, Alwars & Acharyas, I have been lucky to have my blog get such a good response. I have been getting an average of 400 visits per month (330 for February, 440 for March & 200 for the 10 days of this month). I wish to continue and contribute to Sri Vaishnavam in my small and humble way. I kindly request you to leave a comment with your blessings and suggestions for the blog. These would be really encouraging for me. As the blog title suggests this blog is about Sri Vaishnavam, but unlike other blogs this blog wouldn’t feauture new articles written by the author. This blog will act more like a source of information on whats happening in the Sir Vaishnava world. This blog will be updated regularly and utmost importance given to quality of content as well as design. The author feels that inspite of many sites and blogs on Sri Vaishnavam, very few have the technical & design finesse. Sri Vaishnavam defenitely needs a top notch website. This blog is a pre-cursor to a full fledged website on Sri Vaishnavam.